KM Coating offers the five high pressure hoses used most by painting contractors with their airless spray equipment. Whether you require Graco airless paint sprayer hose or Wagner Procoat airless paint sprayer hose, you can find the right pressure hose to get the job done. Each of our contractor paint spray hose is constructed with a double braid of polyester textile fiber making them lightweight and giving them excellent lay flat characteristics. However, if a higher PSI pressure hose is required, try one of our industrial paint supply hose which will certainly solve your fluid dynamics needs. The most popular contractor high pressure hose is the 1/4” by 50 foot. 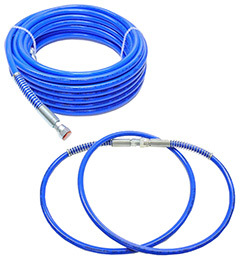 This airless paint spray hose is rated at 3,300 PSI and commonly referred to as Graco BlueMax or Wagner Paint Crew hose. With fluid mechanics in mind, KM Coating offers a premium version of this high pressure hose rated at 3,600 PSI, all at discounted prices. This high pressure hose can be seen applying a wide range of spray coatings including stains, lacquers and oil based paints to solve your fluid handling requirements.